"This isn't a quilting blog…"
My childhood best friend, Lisa, uploaded some of her quilts – they’re beautiful! She participates in such things as … patch… swaps… or something, in which people send each other fabric or blocks or other things and the results are quite nice. 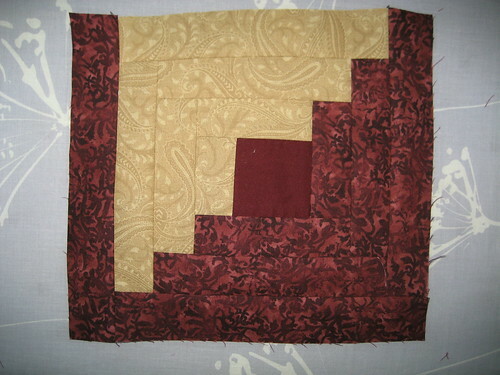 It looks like she’s got hotlinking turned off for Flickr, though, so I can’t share the actually photos, just the link: Lisa’s Quilts. Turning a pair of jeans into a skirt. Mostly. My Design Wall Has … A Design On It! 2 responses to "This isn't a quilting blog…"
Keep in mind this is FOLK ART! How straight do you think the blocks were by women traveling via covered wagon? I think it looks pretty good for a beginner. My first attempt was a checkerboard that ended up rectangular. True! Still, as an only child, I can’t help but beat myself up over imperfections. This one just took the cake, though – wrong color! I do plan to take your advice and start hand-piecing, though, especially since I’m bed-ridden tonight with a messed-up lower back. Hunching over a sewing machine sounds unfun.